Electric vehicles and most electronic devices, such as cell phones and laptop computers, are powered by lithium-ion batteries. Until now, manufacturers have had to design their devices around the size and shape of commercially available batteries. But researchers have developed a new method to 3-D print lithium-ion batteries in virtually any shape. They report their results in ACS Applied Energy Materials. Most lithium-ion batteries on the market come in cylindrical or rectangular shapes. Therefore, when a manufacturer is designing a product—such as a cell phone—they must dedicate a certain size and shape to the battery, which could waste space and limit design options. Theoretically, 3-D-printing technologies can fabricate an entire device, including the battery and structural and electronic components, in almost any shape. However, the polymers used for 3-D printing, such as poly(lactic acid) (PLA), are not ionic conductors, creating a major hurdle for printing batteries. Christopher Reyes, Benjamin Wiley and colleagues wanted to develop a process to print complete lithium-ion batteries with an inexpensive 3-D printer. The researchers increased the ionic conductivity of PLA by infusing it with an electrolyte solution. In addition, they boosted the battery’s electrical conductivity by incorporating graphene or multi-walled carbon nanotubes into the anode or cathode, respectively. To demonstrate the battery’s potential, the team 3-D printed an LED bangle bracelet with an integrated lithium-ion battery. 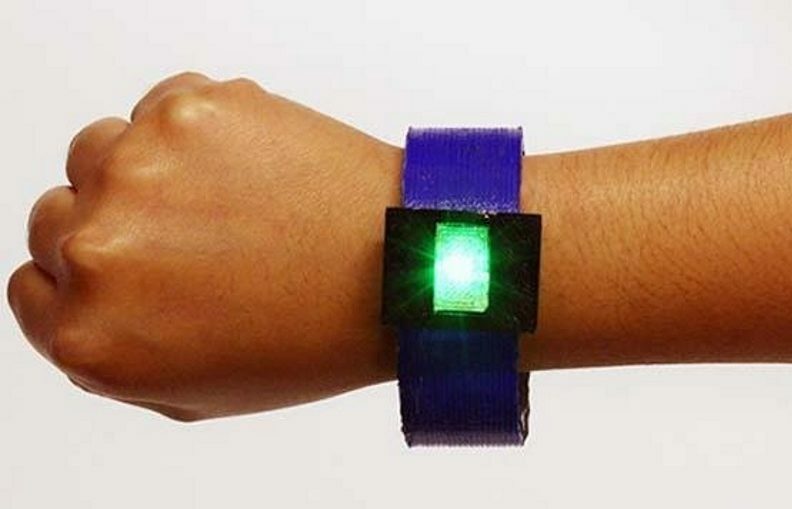 The bangle battery could power a green LED for about 60 seconds. According to the researchers, the capacity of the first-generation 3-D-printed battery is about two orders of magnitude lower than that of commercial batteries, which is too low for practical use. However, they say that they have several ideas for increasing the capacity, such as replacing the PLA-based materials with 3-D-printable pastes.